Assisi, in the heart of Umbria, half-way up mount Subasio at about 425 m. on sea-level, is an artistic spot of extraordinary interest. Visitors are arriving all the year long from all over the world, they are attracted by art treasures and by the remembrances of S. Francesco that this town is jealously prerserving. The town is placed on the hill side looking south. 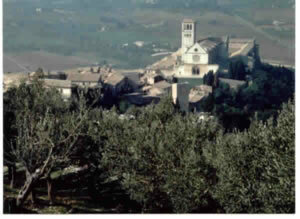 The enchanting valley, the mild hills, the climate and the air make of Assisi an ideal spot for long sojourns. Due to his position in the region and to a modern communication system Assisi is a perfect starting station to organise excursions to the many interesting and artistic centres of Umbria. THE STORY - In the time of the Umbri, Assis would certainly have come into the sphere of influence of itsrich and powerful Etruscan neighbour, Perugia. From being an ally of Rome, the town became a Roman "Municipium" under the name of Assisium and enjoyed considerable prosperity, as the remnants of its former splendour clearly testify. Christianity was brought here in the III century A.D. by the bishop-martyr, Rufino. The barbarian invasions and the Fall of the Roman Empire set the seal on a period of decline, made worse by the devastation caused by the prolonged Graeco-Gothic conflict. Little is known about life in assisi after the Lomabrd conquist when it became part of the Duchy of Spoleto. The town's revival dates from the XI century when new religious foundations and new construction work are documented. Frederick Barbarossa placed Assisi under direct imperial jurisdiction but the Emperor's viceroys were put to flight in a popular uprising which heralded in a period of communal rule during which feuding between the nobility and the populace and battles against Perugia and the feudal overlords were all too commons. It was this period that saw the birth of St.Francis and the Growth of the Franciscan movement, with Assisi reaching the apex of its glory in the XIII century. Another period of decline began in the late XIV century when the town was torn apart by internal struggles, had to submit, in turn, to the Viscontis, Braccio da Montone and the Sforzas, and was sacked many times, most ruinously by Piccinino and Valentino. From the XVI century until 1860 Assisi was part of the Papal States. After the discoveries of the bodies of St. Francis (1818) and St. Clare (1850) and also thanks to renewed interest in the Middle Ages during the Romantic period, Assisi once more became a destination for pilgrims and intellectuals and, since the end of the XIX century, this new thrust of tourism has brought about the rebirth of the economy and the revitalization of the town itself. ITINERARY IN TOWN - Begins from the grand Basilica of St. Francis, consists of two superimposed churches, the Lower Church built between 1122-1824. The square leading up to the Lower Church is framed by colonnades erected in 1474. The beautiful twin Gothic portal, surmounted by three rose windows dates from the second half of the XIII century. The interior, in the shape of a'tau'cross, originally had only a single aisle, the side chapels being an addition from the end of the XIII century. Worthy of note are the stained glass windows reputedly the work of Giovanni di Bonino and his craftsmen. The Upper Church has a plain cuspicated facade emebllished with a twin portal in Gothic style, and a magnificent rose window. The single-asiled Gothic interior receives light through the large stained glass window held to be work of German and French master craftsmen, and the artist known only as the Maestro di San Francesco. The Upper Church is the model for all Franciscan churches. The basilica complex also comprises a Romanesque bell-tower and the Sacro Convento Monastery towering majestically over the valley below. The Monastery also houses a theological college, a library with a vast collection of codices and incunables from the XVI century and earlier, a collection of precious objects on view in the Gothic Hall and the Perkins Collection consisting of works by Italian artists mainly from the Florentine and Sienese schools. Worthy of note are the frescoes: the Lower Church is the cradle of great Italian painting.. In the nave there are frescoes from the middle of the XIII century by the Maestro di San Francesco. The side chapel dedicated to St. Martin contains the complete cycle of stories of the life of St. Martin (1312 - 1315) painted by Simone Martini while the Magdalen chapel was frescoed by Giotto some time after 1305. In the right transept, there is a fresco by Cimabue (1280) together with eight Stories of the Infant Jesus painted by Giotto and his assistants, while in the left transept are the works of Pietro Lorenzetti dating from the first two decades of the XIV century depicting Christ's passion, and the famous "Sunset Madonna". On the cross-vaults are the four frescoes by the Maestro delle Vele Showing the Apotheosis of St Francis and the Allegories of Poverty, Chastity and Obedience. Even more renowned is the decoration of the Upper Church. The presbytery was painted by Cimabue, the transalpine Maestro Oltremontano and Jacopo Torriti. The upper sections of the nabe are adorned with Stories from the Old and New Testaments, the work of Roman and local artists among whom Jacopo Torriti, the Maestro di Isacco, the Maestro della Pentecoste and the Maestro della Cattura. The lower sections are entirely devoted to the famous cycle of frescoes by Giotto depicting in a sequence of 28 frames the significant moments of the life of St. Francis. From the Basilica has begun the Loggia dei Maestri Comacini of the XIII century then in the course of the XV century was enlarged, and served as a habitation for the Lombard artists during their sojourn in Assisi. Also worthy of note are the narrow street of Sant'Andrea leading up to the district known as San Giacomo, the Pilgrim's Oratory containing Xv century frescoes by matteo da Gualdo and Mezzatris and the Municipal Picture-gallery with seat in the Vallemani Palace. Exceeded the Cine-theatre Metastasio rises the Museum and Roman Forum, in Portica road, with exhibits of the Umbro-Roman times and the forum underlying the Piazza del Comune; in surface Piazza del Comune is characterized from the Roman Temple called Minerva (I century A.D.)at the which side rises the Torre del Popolo (XIII century). Opposite rises the Municipal Building, the oldest part of which, the Palazzo Priori, dates from the XIV century to which other buildings were later added. On the right was built in 1615 on the remains of a building believed to be the house of St. Francis' Family. 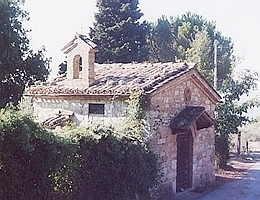 St. Francis was supposedly born in the nearby Oratorio di San Francesco Piccolino. Long corso Mazzini and Santa Chiara road opposite the Basilica of the Saint of Assisi: erected between 1257 and 1265, according the Franciscan model with a cuspidate facade and a single nave, it incosporates the Chapel of San Giorgio where there are some interesting XIV century frescoes and the original crucifix which spoke to St. Francis. The body of St. Claire is preserved in the crypt. The Church of Santa Maria Maggiore was the cathedral church until the XI century. The cuspidate facade is XII century while the apse is from the XIII century. At the outside from the ancient walls, at 4 kilometres from the centre, rises, grand and beautiful the Santa Maria degli Angeli: built between 1565 and 1685 on project of Galeazzo Alessi, preserves in its inside the little Portiuncola Chapel (the small piece of ground where rises the small church was made available for the use of St. Francis and his first companions by the Benedictine monks). Not far from the Portiuncola chapel lies the Cappella del Transito built on the spot where St. Francis died on 3rd October 1226 and containing a polychrome terracotta by Andrea della Robbia and a fresco dating from 1514 by the Lo Spagna portraying the First Brothers. The side chapels of the Basilica are decorated with frescoes by local artists dating from the XV - XVIII centuries. From the Basilica there is a passageway leading to the celebrated Thornless Rosegarden and the Chapel of the Roses frescoed by Tiberio d'Assisi in 1516 with legends connected to the Indulgence. The 12th century Friary houses a museum containing various sacred works of art, archaeological finds, ethnic exhibits and paintings, the most noteworty of which are a fresco by Mezzatris, a Crucifix by Giunta Pisano and a wood-painting of St. Francis by the Maestro San Francesco. Between the places called Franciscan remember also the Hermitage, outside Assisi, on the Monte Subasio, where the Saint praied and where subsequently was built a convent, the Sanctuary of Rivotorto that preserves in its inside the "tugurio" where St. Francis established the his first community of "somma umiliate" in 1208 and the Convent of Saint Damiano where Francis was converted in 1205; after 1212 it was used by St. Claire and her followers. THE TRADITIONS - During the first few days of May, the town enthusiastically celebrates "Calendimaggio" in which the young people, in particular, re-enact scenes of Medieval life. For three days the town is divided into two opposing factions, the Lower Side and the Upper Side, recalling the bloody feuds that raged in the town in the XIV and XV centuries. Nowadays, the contest is "peaceful" with two sides showing theis skills in choral singing, costumed parades, traditional games and perfomances of short plays about life in former times in the more picturesque Medieval streets; the awarding of the prize banner (Palio) is the task of an external panel of judges who assign points for each compatition. Some of the most deeply-rooted traditions are the religious ones and, in particular, those taking place in the week preceding Easter Sunday. On Holy Thursday a statue of the dead Christ is removed from a XVI century crucifix and carried on a bier, on Good Friday morning, in procession from the Cathedral to the Basilica os St. Francis and back again in the evening. The evening torchlight procession is particurlay moving ("Processione del Cristo Morto"). Another very special event in the religious calendar is the "Pulci Procession" on the first Sunday after the Feast of Corpus Christi. It takes place in the narrow streets of the upper part of the town which are decorated for the occasion, by the inhabitants, with magnificent pictorial carpets of flowers. On the 22nd June the Municipal Authorities make a formal offering of votive candles in thanksgiving for St. Clare's having courageously repelled a Saracen attack on the town. Between the 31st July abd the 2nd August a multitude of pilgrims arrives in Santa Maria degli Angeli in order to obtain the Indulgence (Perdono) granted at the behest of St. Francis by Pope Honorius III. However, the feast which is celebreted with the greatest solemnity is that of St. Francis on 3rd-4th Ocotber.